First off-Happy Belated Easter! As you can see from the picture, I survived my last round of chemo and managed to rendezvous with the rest of my family at Karen’s parents place in Menomonie. As you may also be able to see in the picture, my hair continues to fall out and what remains is all turning grey-challenges of chemo. Lastly you can see Pete, Sarah’s boyfriend, in the background starting off his day with not an Easter Egg hunt but rather a hunt for a live feed from a bike race in Europe. Incidentally, Pete did find his Easter Egg the fastest in the big kids hunt. Dianne spoiled me/us with a Ham feast on Saturday night-I felt so blessed to make it. Had I been too sick to go it would have been cold cereal at home for me. 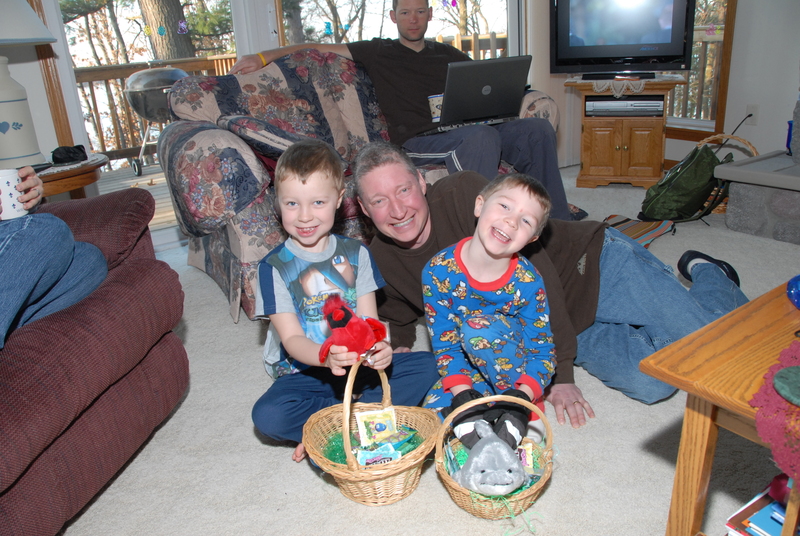 So Easter was great and the boys had a wonderful time! Our team came in 2nd out of 100 teams in the fundraising dept! We raised over $5400 on a goal of $3,000. Thank you so much to all who donated! Your money is going to a very worthy cause. One team beat us in the last two days as they had a big company and its employees donate almost $2500. Good for them and good for our cause. Sunday is the big day-very early morning-7 a.m. at Southdale. We will be located on the South side of the Southdale Mall-near the old Mervyn’s entrance. We have one of the largest teams participating, so I don’t think we will be too hard to find. Sarah or I will get you your team bag and t-shirt, then when everyone is ready they will take a team photo. The run starts at 9 a.m. and the walk starts right after that. We will probably get one last post out about this before the big event. If you haven’t paid Sarah for T-shirts, you can pay her on Sunday at the event. I would guess at least a 3rd of our team I haven’t even met-so I am looking forward to meeting all of you. Again I feel very humbled and blessed at your willingness to help. That is the day of my next scan, so the day after the big race I will get a clear picture on what my immediate future looks like. If the scan looks good, I would guess Dr. Duane will still have me do one last round of chemo on April 22nd, before I go on an 8 week break in preparation for a Liver Surgery. If the scan looks bad, then I would guess I continue on with chemo-possibly switching back to older chemicals or adding the two regiments together. Who knows-either way it will be a big day. Hopefully I will get results by late afternoon and be able to post something before I go to Pray for the Cure at my church that night. Big, big, big day… I will gladly accept any prayers or thoughts you have about me on that day. Overall I am doing well. I actually felt like a I recoverd quicker from this last round. I worked 9.5 hours today, but pretty much had to drag myself out of the office as I was exhausted. I still rallied a bit again when I got home and had two boys who wanted to play soccer with me. They (o.k. Brenden is) are getting excited for soccer and T-Ball/Coach pitch baseball. Jaxson is our dreamer kid and goes along with the sports due to his big brother’s coaching and encouragement. The big challenge this year is they will be on separate teams and play on separate nights. Throw in some health issues and it is sure to be a lot of work and pressure on Karen again. Lucky for me and the guys, she is our Wonder Woman. Thanks for all your thoughts and prayers for Karen, I and the guys. We really appreciate them. They truly do help us during this challenge. Thanks for not pointing out that I look like a racoon! I just heard about what you have been going through. I was very sorry to hear that, but glad that it sounds like things are going as good as they can so far. I will send my positive thoughts and energy your way, hoping for the best. It looks like you have a great family around you … I’m glad to for that. P.S. If it makes you feel any better, my hair has been falling out for years … and I can’t even blame it on chemo! You look good in the picture and your little guys look very happy. It’s good to see you!! Even though we will not be with you on Sunday, our thoughts will be. I hope the weather is just right for everyone participating. Good luck on your scan on Monday. We are praying for good clear pictures to show good findings.